Thousands help kids battling cancer during 6th annual Mad Hatter fundraisers for Hats Off For Cancer | PRLog. On one of the silliest days of the year, Mad Hatter Day, Hats Off For Cancer charity is hosting their 6th annual nationwide Mad Hatter fundraiser and hat drive for kids and teens battling cancer. This is a wonderful opportunity for groups to help. PRLog (Press Release) – Oct 04, 2012 – Thousands help kids battling cancer during 6th annual Mad Hatter fundraisers for Hats Off For Cancer. LOS ANGELES – The 6th of October is one of the silliest days of the year, also known as Mad Hatter Day. It is almost exactly half a year away from April Fool’s Day and is represented by the illustrations found in the hat of the Mad Hatter in Alice’s Adventures in Wonderland. In celebration of this silly day, Hats Off For Cancer is hosting their 6th annual nationwide Mad Hatter fundraiser and hat drive for children and teens battling cancer. Since its founding in 1996, Hats Off For Cancer has donated more than 1,500,000 brand new hats to hospitals, camps and individuals worldwide. This event provides a wonderful opportunity for groups to raise funds, awareness, and provide hats to children and teens with cancer. In 2011, a record of over 500 groups participated in this wonderful event. With the help of schools, businesses, churches and sports teams across the country, Hats Off For Cancer hopes to bring even more smiles to the faces of children with cancer. Events are currently planned in: Alabama, Alaska, Arkansas, California, Colorado, Delaware, Florida, Georgia, Idaho, Illinois, Indiana, Iowa, Kansas, Louisiana, Maine, Maryland, Massachusetts, Michigan, Missouri, Nebraska, Nevada, New Jersey, New Mexico, New York, North Carolina, North Dakota, Ohio, Ontario, Oregon, Pennsylvania, South Carolina, Texas, Utah, and Washington. It’s not too late for groups to register their events at the Hats Off For Cancer web site: http://www.hatsoffforcancer.org/mad-hatter-drive. Hats Off For Cancer collects and donates hats of all kinds to the courageous children who lose their hair due to cancer treatments. As one of the leading and original hat programs, Hats Off For Cancer has donated more than 1,500,000 brand new hats to hospitals, camps, and individuals worldwide since 1996. Hats Off For Cancer continues to focus on ways to improve the lives of children and teens battling cancer. Hats Off For Cancer is recognized by the IRS as a 501 (c) 3 non-profit organization. More information can be found on the Hats Off For Cancer web site: http://www.hatsoffforcancer.org. 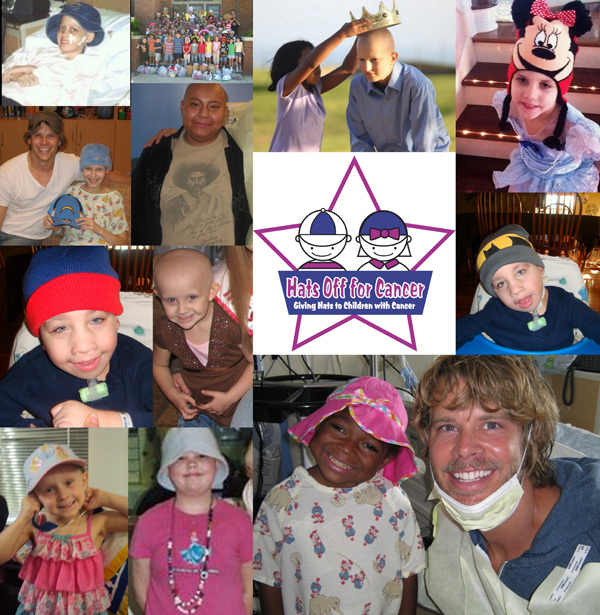 Watch the Hats Off For Cancer Public Service Announcement featuring NCIS LA actor Eric Christian Olsen: http://www.youtube.com/watch?v=VEIV7W5YlfU.